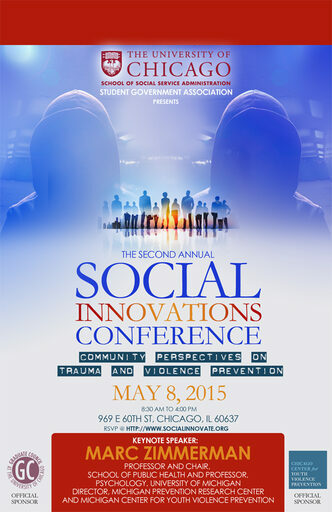 Welcome to the 2015 Social Innovations Conference: Community Perspectives on Trauma and Violence Prevention, is a graduate student led conference at the University of Chicago, School of Social Service Administration. 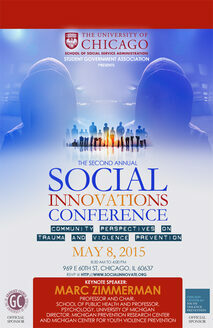 This conference was designed to engage community members, stakeholders, and organizations in exploring the interaction between trauma-informed care and violence prevention efforts in Chicago communities. Violence within communities has a significant impact on the quality of living for residents, property values within the community, and its economic development. Unresolved exposure to violence can lead to future perpetration of violent acts. We hope this conference will lead to a better understanding of how trauma-informed care and violence prevention efforts can reinforce each-other. Violence prevention often stems from the perspective of service providers, rather than from that of a collective community. This conference will outline the importance of the community members and service providers collaborating to address violence. During this conference, we will hear from community-based organizations, community leaders, and the youth who are most impacted by these programs. The objective of this conference is to create a space where participants will engage in dialogue and receive feedback, insight, and resources from individuals that have worked within their communities to address violence. Furthermore, our goal is to provide participants with resources that can be used to take back to the communities they serve. The conference will serve as an ideal place to connect and network with like-minded individuals addressing violence within their communities. The objective of this conference is to create a space where participants will engage in dialogue and receive feedback, insight, and resources from individuals that have worked within their communities to address violence. Furthermore, our goal is to provide participants with resources that can be used to take back to the communities they serve. The conference will serve as an ideal place to connect and network with like-minded individuals addressing violence within their communities.